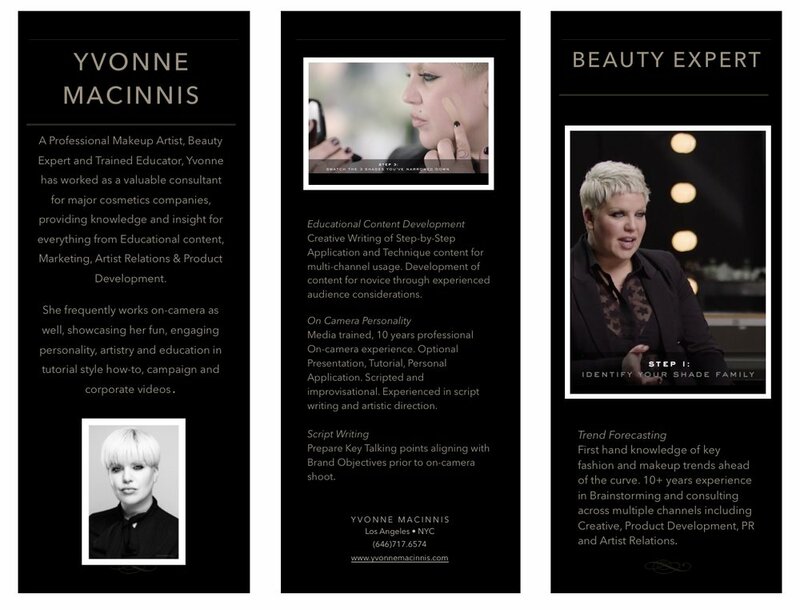 As a Professional Makeup Artist, Beauty Expert and Trained Educator, Yvonne has worked as a valuable consultant for major cosmetics companies, providing knowledge and insight for everything from Educational content, Marketing, Artist Relations & Product Development. She frequently works on-camera as well, showcasing her fun, engaging personality, artistry and education in tutorial style, how-to, campaign and corporate videos. Credits/Clients: MTV, Haus of Gaga, Marc Jacobs Beauty, Becca Cosmetics , Victoria’s Secret, Gigi Hadid, Winnie Harlow, Coach, Calvin Klein, Prabal Gurung, Pat McGrath, Tommy Hillfiger, Make Up For Ever, M.A.C. Cosmetics, Sephora, KISS USA, Giorgio Armani, Bergdorf Goodman, Neiman Marcus, Runway Rogue, Stilazzi, The Makeup Show, The Powder Group, Qosmetix, Much Music, Marco Marco, Hallie Sahar, Allie X, Milk Makeup. Print and Online Publications: OOB Magazine, NYLON Singapore, ROGUE, SALTY, Teen Vogue, The New Yorker, Style Caster, iMirage Magazine, l’Officiel Australlia, On Makeup Magazine, PopSugar, XIOX Magazine, Fantastics, Buzzfeed, Refinery 29, Emmy Magazine.